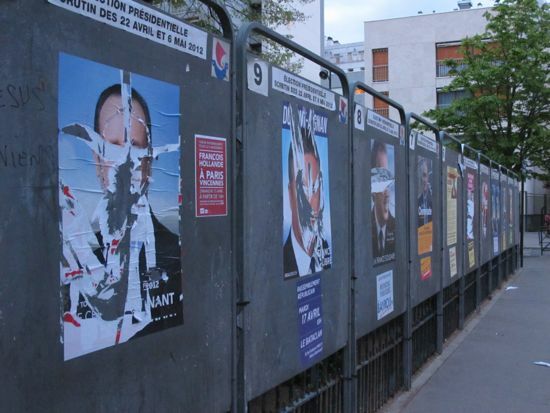 Defaced election posters in Paris. Credit: A. D. McKenzie/IPS. PARIS, Apr 18 2012 (IPS) - Candidates in the French presidential election are coming to use the word ‘immigrant’ like a ball to be kicked around from one side to another, analysts say. “Boot all the immigrants out, and everything will be fine. That’s the seductive and deceptive message from some candidates,” says French professor Nonna Mayer. But just who are these “immigrants” that have become so central to the two-round elections, set for Apr. 22 and May 6? For some French people, it’s “anyone who looks different,” says Mayer, professor at Sciences Po university and an expert in studies on racism and anti-Semitism. She told IPS that there is a hierarchy assigned to those perceived as being “foreign” in France, with the “most disliked” group being of Maghrebi origin, while the “least disliked” are Jewish. People of sub-Saharan Africa are generally viewed favourably, while in surveys Asians “fall somewhere between the Jews and sub-Saharan Africans,” Mayer adds wryly. French law forbids official ethnic classification of the population, but studies by the Organisation for Economic Cooperation and Development (OECD) put the percentage of foreign-born residents at above 10 percent of France’s 63 million people. About a third of these residents come from other European Union countries; but these are not the target of politicians. At a college debate on ‘French Elections: Inequality and the Populist Turn’ last week, Mayer and other social scientists noted that overall the term “immigrants” has largely become synonymous with Muslims. The anti-immigrant rhetoric from parties such as the far-right National Front is in effect a rejection of Islam in France, they said. National Front leader Marine Le Pen has made the ritual slaughter of animals, such as in halal meat production, an issue in the campaign. She has tried to galvanize the French electorate by saying that millions of French people are eating halal meat unknowingly. She also criticised Muslims who prayed in the streets, describing the practice as an “invasion”. Last September France banned street-prayer although some of the country’s estimated five million Muslims lack prayer space. This followed a ban on the burqa and other face-covering veils. Le Pen strives publicly to make a distinction between French Muslims “who love France” and Islamic fundamentalists or radicals, but many say her supporters do not see this difference. Le Pen is currently third in the polls, alongside the Left Front, and seems to have little chance of winning the presidency when the elections go to the second round. But her message has been taken up by President Nicolas Sarkozy, who is running neck-and-neck with his Socialist challenger Francois Hollande. There are ten candidates competing in the first round. Sarkozy revealed this change with a speech he gave in Grenoble in July 2010, following social unrest in the city. He said then that the government would look at revoking the French citizenship of immigrants who endangered the lives of police officers or others in public authority. The speech came shortly after he ordered the expulsion of Roma, or Gypsies, living in France illegally, which led to France being reprimanded by the European Union. Since then, some of Sarkozy’s strongest language has come in apparent efforts to outdo Le Pen. Last month, he said that France was a country of “too many foreigners” and he pledged to cut back on immigration if re-elected. Other political parties have rejected the targeting of immigrants. Jean-Luc Mélenchon, leader of the Left Front (Front de Gauche) has called Le Pen “semi-demented” and a “hypocrite” and says her party is “racist”. Socialist challenger Hollande has maintained a more neutral tone, saying that France’s duty is to integrate its immigrants. Over the past months, he has met with different religious groups, to explain his views and gain their backing. He has instead focused on the super-rich, pledging to raise their tax rate. Political commentator and author Alan Riding says that Hollande does not appeal to people’s fears, “but nor does he inspire hope.” Still, most French people of “immigrant” origin surveyed said they would vote for the Socialist party. Religious groups, too, have been making their voices heard. Claude Baty, president of the Protestant Federation of France, said that when “fear of the other…motivates behaviour”, it becomes a matter of urgency to take steps to see real people rather than stereotypes. Baty and others have said that the immigration focus is a way for leaders to distract voters from other more pressing concerns such as the economy and failures in education. Mayer told IPS that she expects tolerance to return after the elections because France has traditionally been a country that welcomes asylum seekers. A recent report from the United Nations refugee agency, the UNHCR, shows that France received 51,910 requests for asylum in 2011, up 8 percent from the previous year. This was the second highest number of asylum claims, after the United States. The majority came from Afghanistan, where French soldiers are involved in the military operations. The increase for France was the fourth time in a row, according to the UNHCR. This fuels the perception among certain segments of the population that too many “foreigners” are coming to France, says Mayer. But she adds that mainstream parties such as Sarkozy’s UMP were playing a “dangerous game” when they echo the far-right and target immigrants.